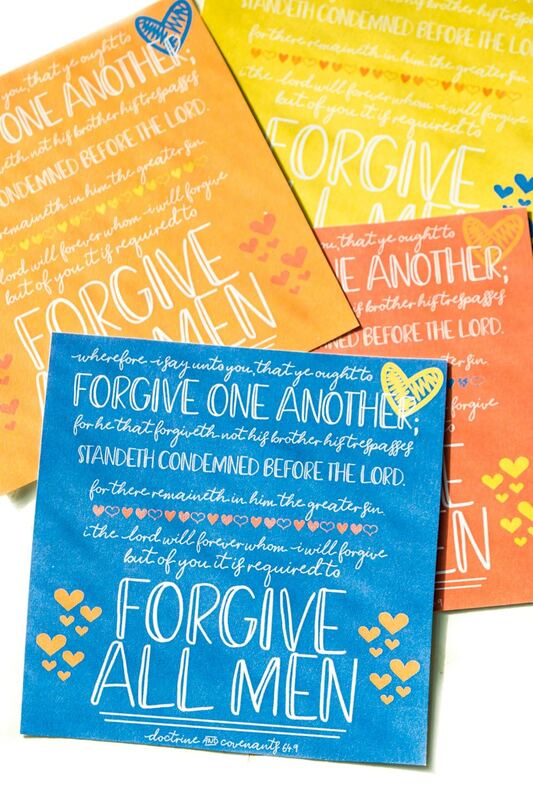 These forgiveness handouts are perfect for a lesson on forgiveness or an activity centered around forgiveness and the atonement. Use the handout and the forgiveness quotes to prepare and send your class home with a reminder of what they’ve learned! With General Conference coming up this weekend, I thought it would be fun to share a couple of the handouts that I made for a Relief Society activity straight from April’s General Conference. If you’re not sure what General Conference is, it’s a bi-annual conference in April and October for the Church of Jesus Christ of Latter-Day-Saints where the living prophets, apostles, and other leadership speak to the members of the church worldwide. You can learn more about General Conference and why it’s an event I look forward to every spring/fall here. Every September, my congregation’s Relief Society (the name for the women’s program in the LDS church) puts on a General Conference book club. 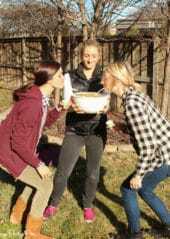 We spend the summer reading the General Conference edition of the Ensign and then use the book club to talk about which talks, principles, etc. touched us the most. This year we changed things up a bit and did five round table conversations about five main themes, and I created handouts for each of them.The ideas was to have it kind of like a progressive date where you hop from one themed table to another and talk about a theme then get a handout that goes along with the theme. 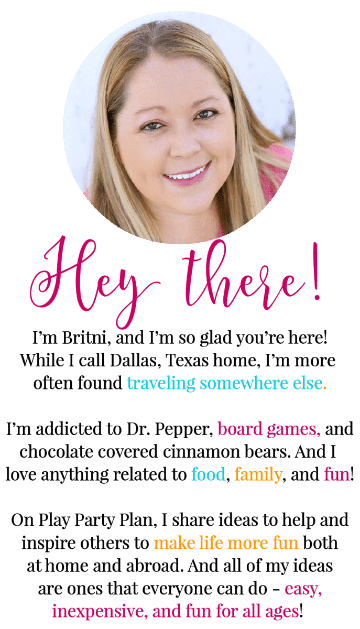 It’s been a while since I created handouts for young women, like these prayer handouts and these priesthood handouts, and it was a lot of fun to be able to be creative again! I’ll be posting each of the handouts over the next couple of weeks but for now, here are the five themes that we did based on April’s General Conference sessions. I’m starting today with forgiveness and the atonement. I made these handouts from one of the most well-known forgiveness verses in Doctrine & Covenants 64:9. Wherefore I say unto you, that ye ought to forgive one another for her that forgiveth not his brother, his trespasses standeth condemned before the Lord, for there remaineth in him the greater sin. I the Lord will forgive whom I will forgive but of you it is required to forgive all men. And in case you noticed the typo in the actual photos, I did fix the file so that it says I the Lord will FORGIVE, not FOREVER. 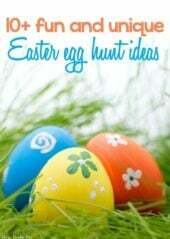 The handout comes in four different colors – blue, yellow, orange, and coral. I recommend since they take quite a bit of ink to get them printed at your local office store. 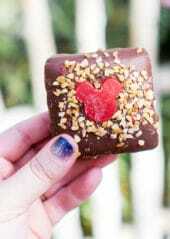 Print them on white card stock so they last better and just tape the candy or treat to the back of the handouts! One of the other things we’ve done in the past is to put conference quotes and discussion questions on the table to get people started in the discussion. 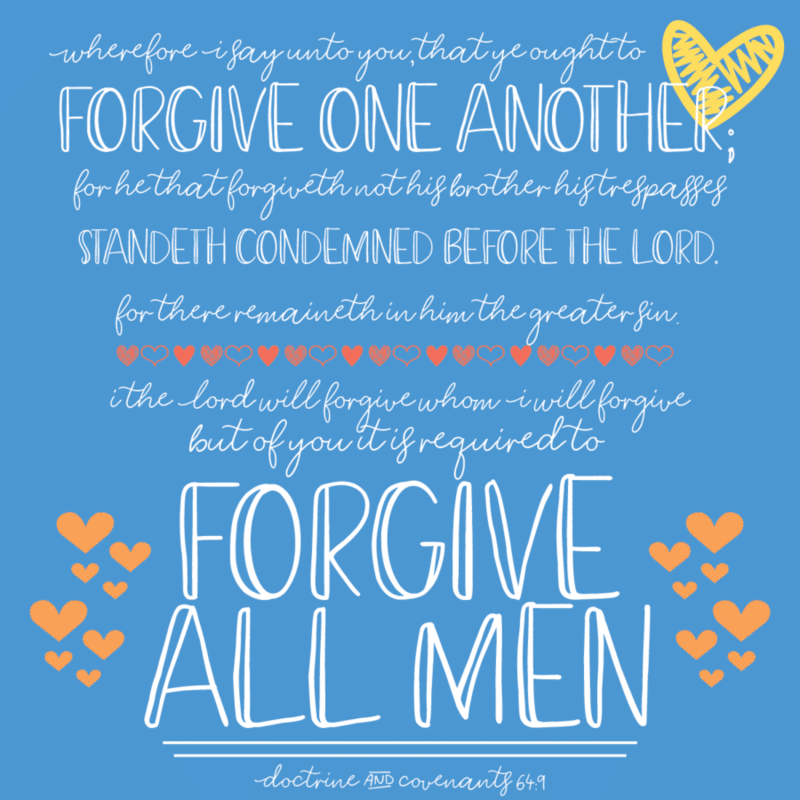 Here are some of my favorite quotes on forgiveness and the atonement from the April 2018 General Conference sessions. 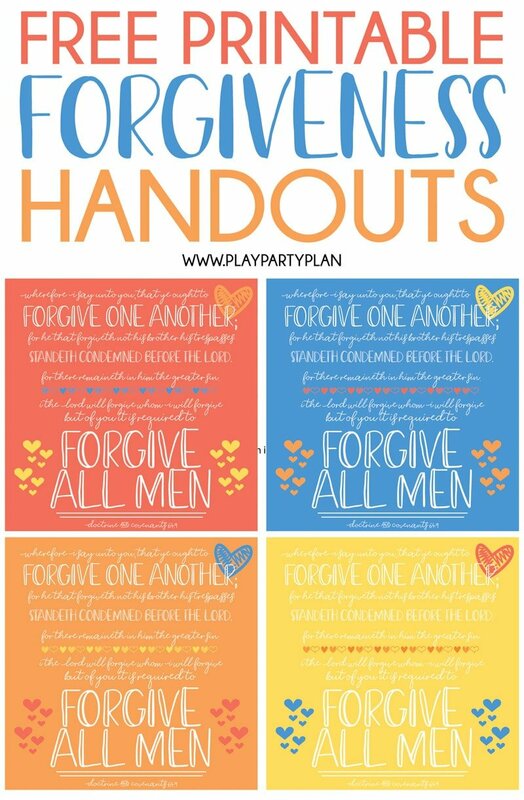 These would also come in handy if you need to teach a lesson on forgiveness and want to use these handouts for the lessons! Real intent implies real effort and real change. Change is the principal word the Guide to the Scriptures defines in repentance. I change of mind and heart that brings a fresh attitude toward God, oneself, and life in general. That kind of change results in spiritual growth. Our success, then, isn’t going from failure from failure, but growing from failure to failure without any loss of enthusiasm. 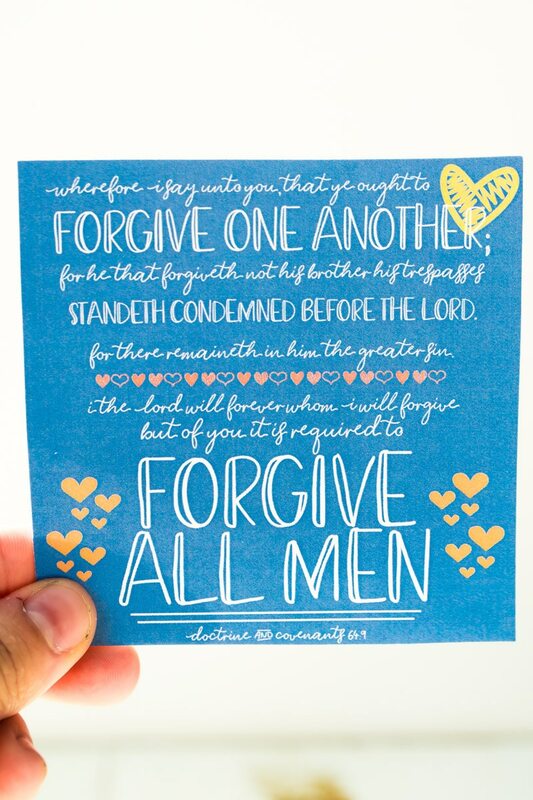 And last but not least, here’s a link to find all of the scripture verses with the word forgive in them! There are too many amazing verses for me to choose from so take your pick. 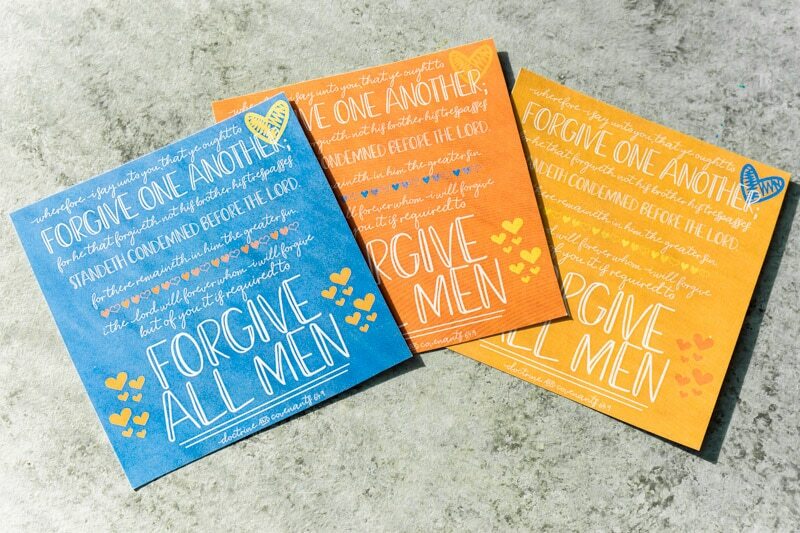 Don’t forget to pin these forgiveness handouts and forgiveness quotes for later.